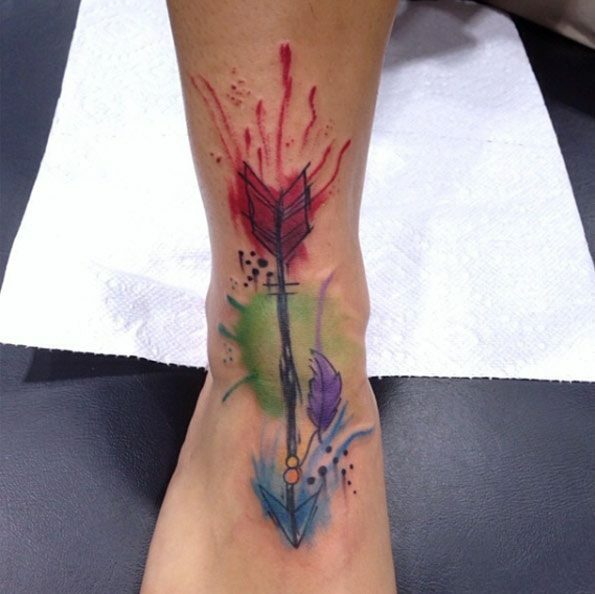 Arrow tattoos are famous body tattoos that are worn by thousands of tattoo lovers in the world. These tattoos have been the favorite of many people even in the past years. What is being loved by many regarding an arrow design is the fact that it is very simple in design. Even though it is just a simple design, it cannot be denied that it looks very elegant. Just in case you do not know, there are also a lot of tattoo first-timers out there who are choosing them to be engraved on their body. Because of the simplicity of the design, you will only spend lesser amount of money for it. One reason is that the tattoo artist that you choose will have easier moments in engraving the tattoo on your body. Aside from that, such tattoo will only require minimal effort and time. In other words, this tattoo would be the perfect choice of many. Protection –The number one thing is symbolizing is protection. Native Americans strongly believe that arrows are used in hunting wild animals and enemies. This explains why the tattoo can be a good sign of protection. If you want to be well protected at all times, then wearing such tattoo might be a thing that you want to take into account. Friendship –Another thing is symbolizing is friendship. 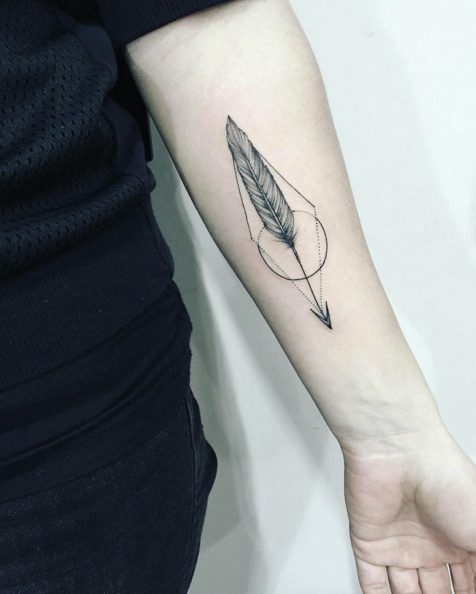 Even so, in order to achieve such symbolism, you should consider the arrow design that you are about to engrave on your body. 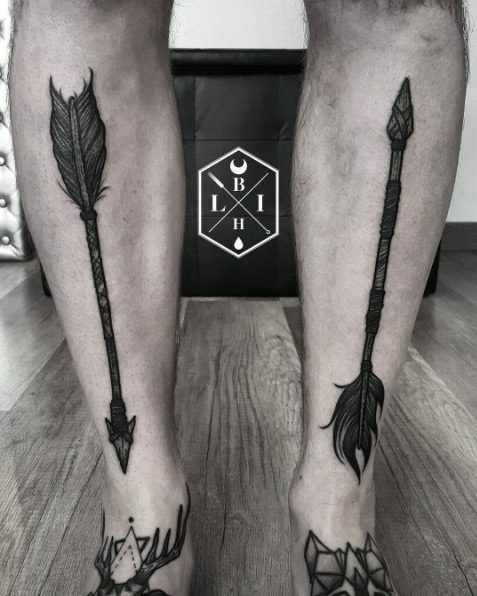 Two crossed arrows should be the tattoo design that you should choose. 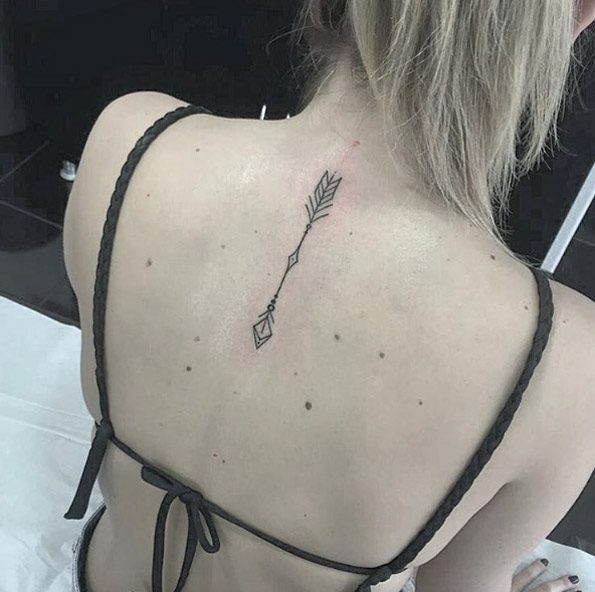 Positivity –An arrow is also a great symbol of positivity. 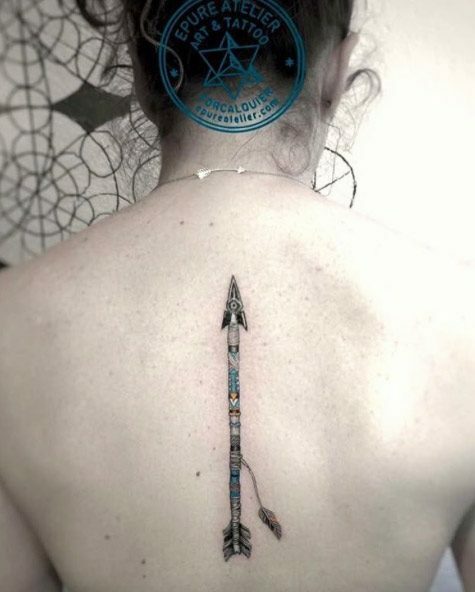 In case you are a positive type of a person and you want to tell the other people around you that you are this kind of person, then putting an arrow design on your body is the only thing you need to do. Moving Forward –I means that you keep on moving forward. The literal explanation for this is that the image of an arrow is directing you to somewhere that it points out. In other words, an arrow is saying that you keep on moving forward in your life no matter if you are experiencing so much trouble in life. Achievement – It means achievement. Hence, it is no longer surprising why there are a lot of people in the world who have achieved something that wear such tattoo. 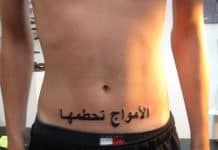 If you think that you have already achieved a lot of great things in life, then why not go for such tattoo. Love – Do you know that such tattoo is also symbolizing love? It is simply because an arrow is used by Cupid in making two people in-loved to each other. In order to emphasize the love meaning of your tattoo, you can add some more designs like beautiful flowers and heart. Masculinity – It is also popular to be symbolizing masculinity. This is the main reason why there are so many men tattoo lovers in the world who are wearing such tattoo. Even so, this does not mean that women tattoo lovers can no longer wear this tattoo. You just have to add some sub designs in order to make the entire design more feminine. 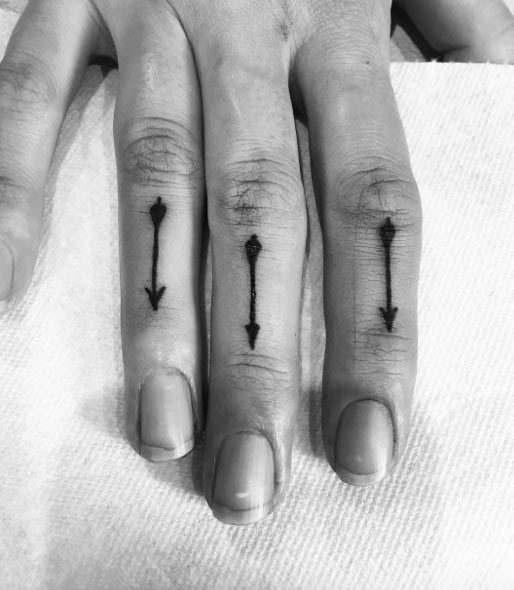 Single Arrow Design–For sure, many will agree that a single arrow is the most common design that you can consider having on your body. Even though it is a very simple design, it does not mean that it can no longer serve its beautification purposes. It will certainly look great on you, plus it can convey the message that you want to tell to the other people around you. 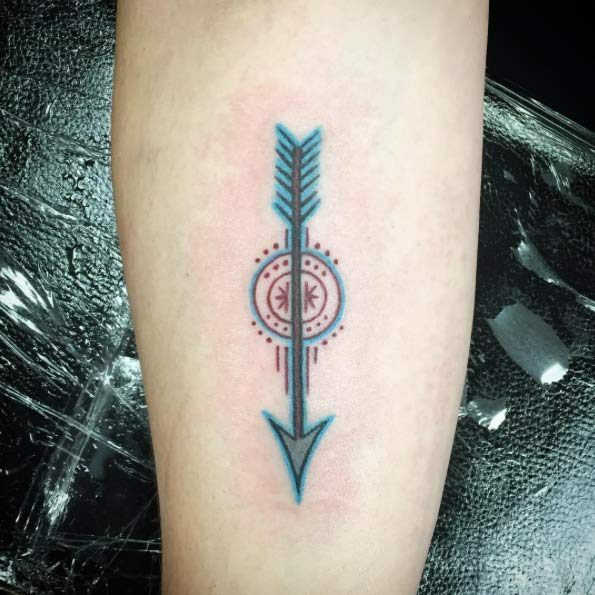 Double Arrows Design –If you do not like the single arrow design, then maybe you want to consider the double arrows tattoo design. There can be several meanings that can be conveyed by this particular design. 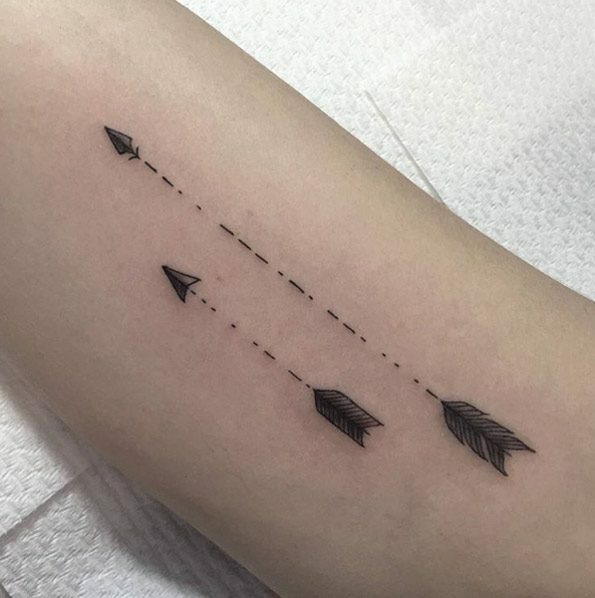 If the two arrows are crossing each other, then it is symbolizing friendship. You can simply dedicate such tattoo to the best friend of your life. 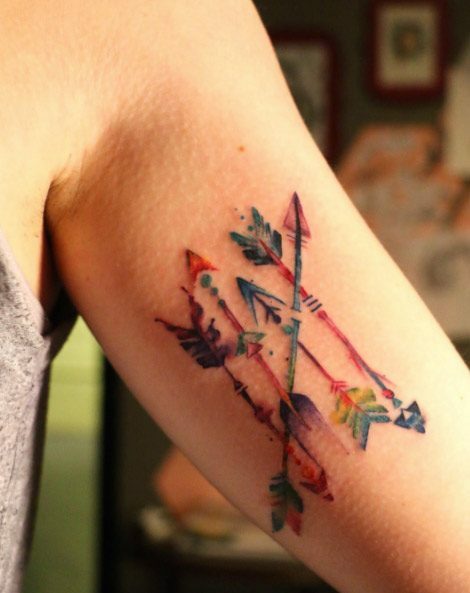 Even so, if the two arrows are pointing away from one another, such tattoo is symbolizing war. 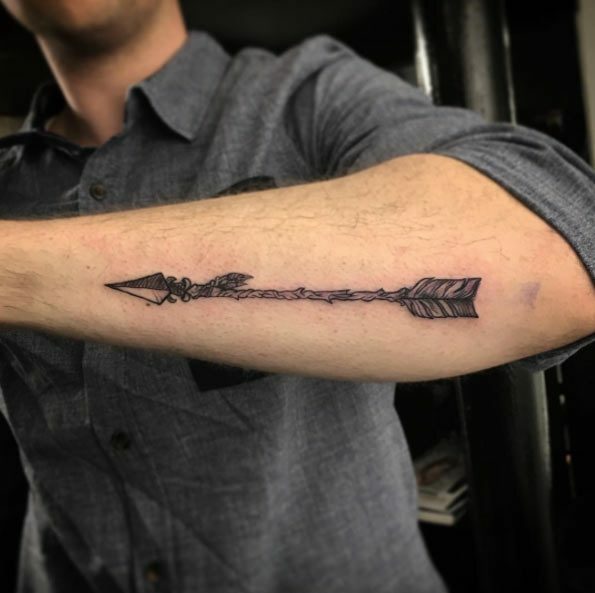 Broken Arrow Design –Another very common design for an arrow that can be seen on tattoo lovers’ body in the world is the broken arrow. If you are thinking that a broken arrow can never make you look gorgeous, then you are absolutely wrong. There is no way it will not look great, specially when combined with some other beautiful designs that can emphasize the message that you want to tell to others. The meaning of such tattoo design is peace. The broken arrow is telling you that war should be stopped. 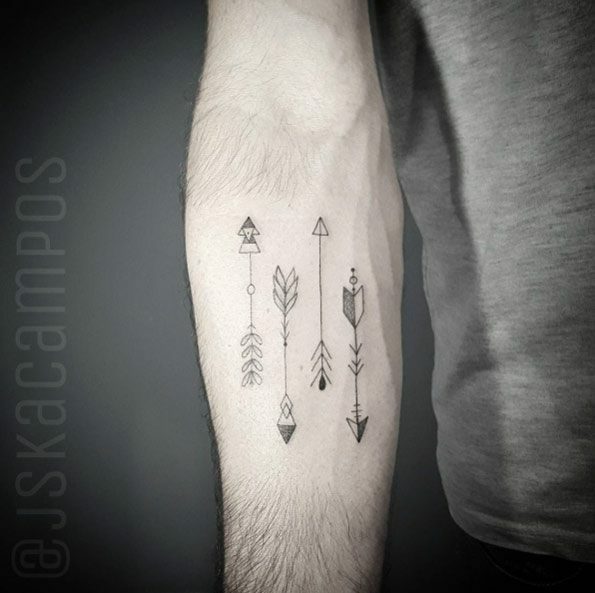 Multiple Arrow Design –It is also very common to see people who are wearing multiple arrow designs, regardless if they are drawn in smaller or bigger sizes. 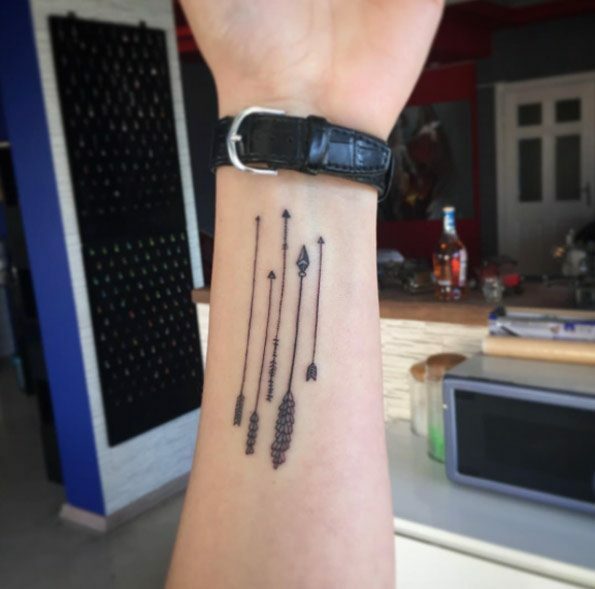 Most of the time, there are 5 arrows that are drawn in this particular tattoo design. 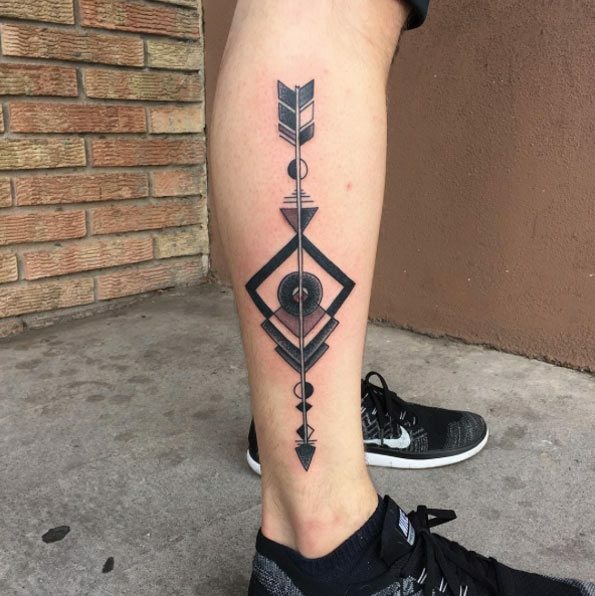 This tattoo design is symbolizing strength and unity. The explanation for this is that many arrows can be very hard to be broken when compared to a single arrow. 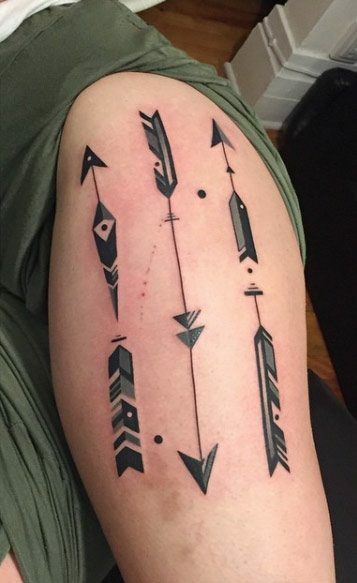 An arrow design is formed by simple lines done mostly in black, though colors may be used in some cases depending upon the choice of the bearer. Basically, it is the size of the tattoo which determines its placement. 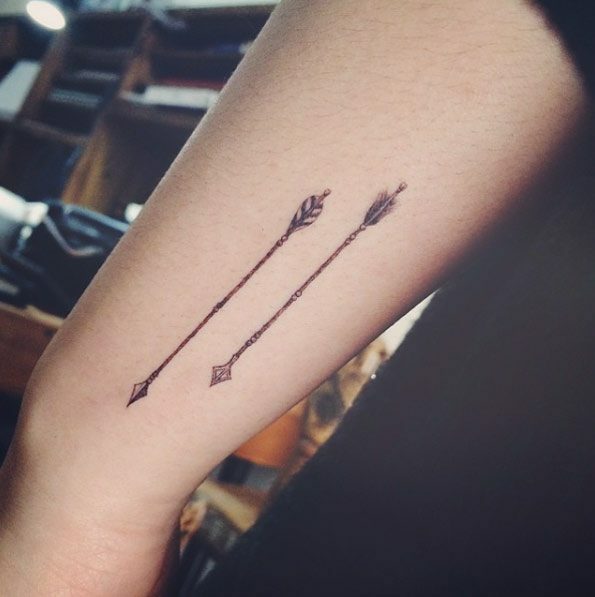 A small sized arrow design can be inked on the wrist, ankle or finger, while a medium to bigger one can be done on the side, back, shoulder, chest, arm, thigh or leg. The prolonged shape of this kind of tattoo also makes it ideal to be placed along the spine. Single Arrow – One of the most widely used arrow designs is the solitary arrow, which as in its common symbolism, points towards a direction. 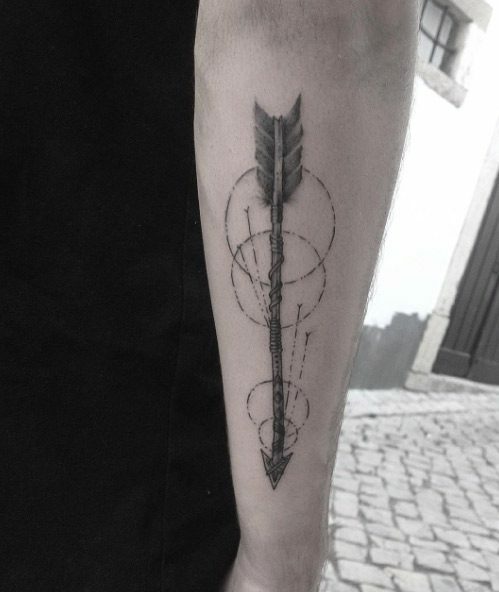 Another meaning of a single arrow is protection from the evil and negative forces. Two Arrows – As explained earlier, two arrows which cross each other stand for friendship as per the Native American culture. They can be used as a matching tattoo with one’s best friend. On the other hand, two arrows which point away from each other depict war. A Bundle of Arrows – A common arrow design shows a bundle of multiple arrows, usually five in number. These arrows bundled together stand for unity and strength, as a single arrow can be broken easily while it is hard to break a bundle of them. 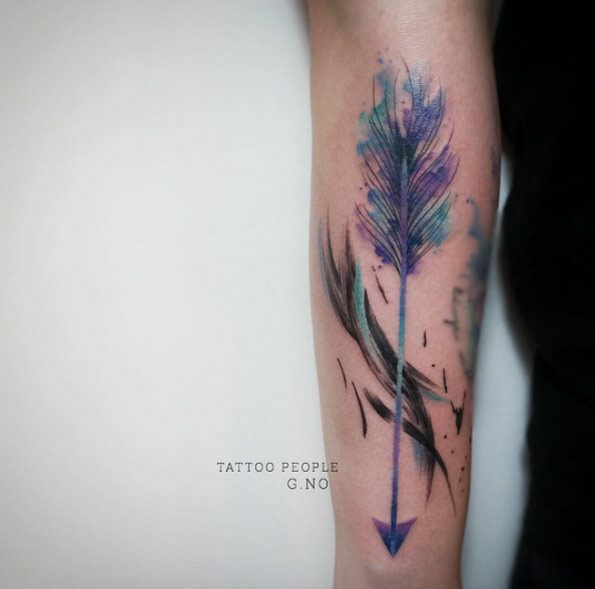 Some other tattoo designs incorporate these arrows with elements like feathers, dreamcatcher, anchor, flowers, diamonds and hearts, each one having its own meaning, an arrow passing through a heart is a commonly seen design which shows broken heart and pain in love. On the other hand, an arrow passing through a diamond signifies courage and positivity, which takes a person on the path of success in life. 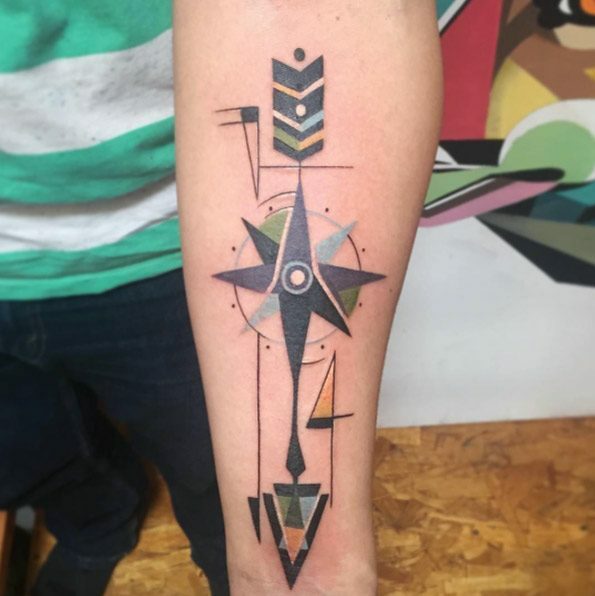 An arrow can also be done along with a compass or Nautical Star for representing direction. Another popular arrow designs features a bow with an arrow strung on it, ready to be shot. 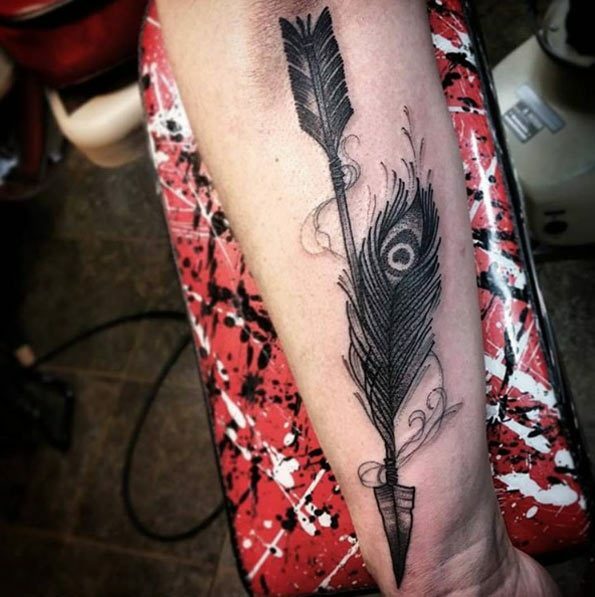 Most of the time, an arrow tattoo will be seen in the conventional black color as its prominent shape makes it easily recognizable, but in newer designs, use of color makes these tattoos more vibrant and eye catching. 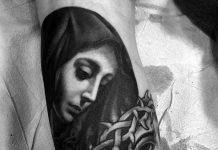 These simple yet attractive tattoos are a top choice among tattoo lovers of both sexes and all ages. Lynn Gunn–For sure, you are one of those people who love the gorgeous beauty of Lynn Gunn. But when you see her arrow design, you will definitely love her even more. This tattoo is located on her left forearm. Ellie Goulding–Ellie Goulding is a very popular name when it comes to the music industry. Ellie has this beautiful arrow design located on her right index finger. 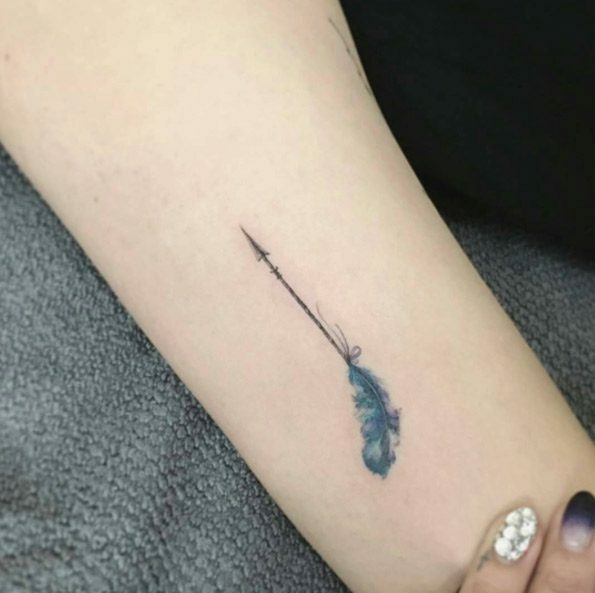 What makes such tattoo very unique is the fact that it is colored with white ink. 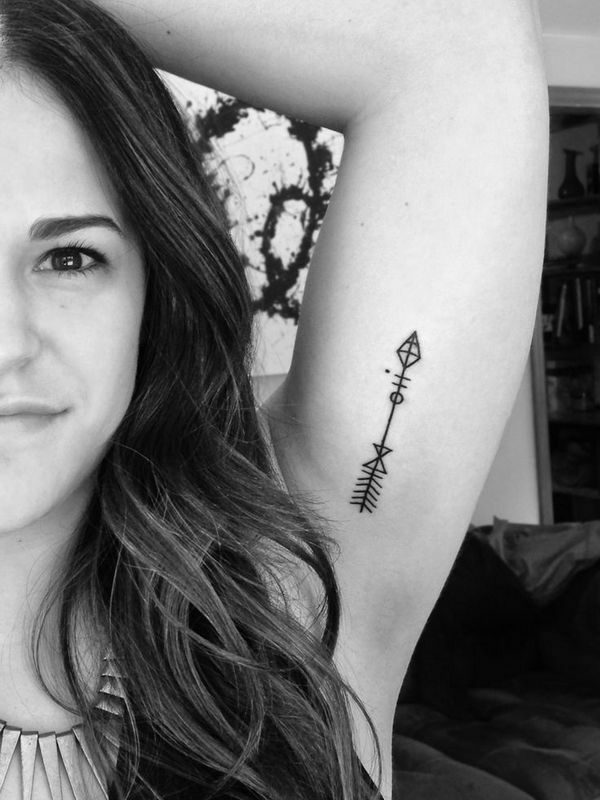 Bethany Cosentino– Bethany Cosentino looks even more gorgeous with her arrow design located on her chest. The design is a two crossed arrow. 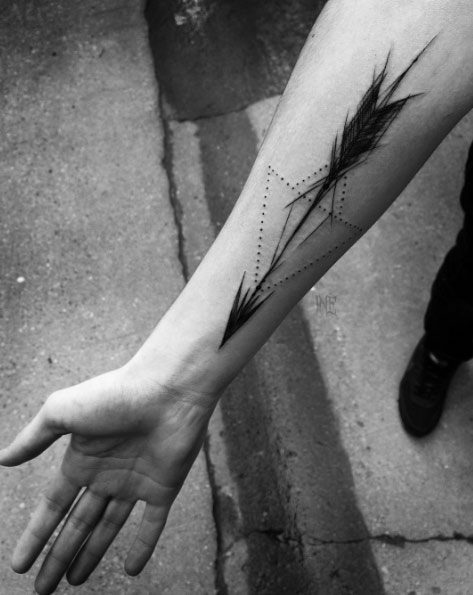 Arrow tattoos are definitely worth considering tattoos that you can beautifully have on your body. Just think of the best part where you can place the tattoos. With the amazing beauty and meanings of these tattoos, there is no way you will not love wearing them.